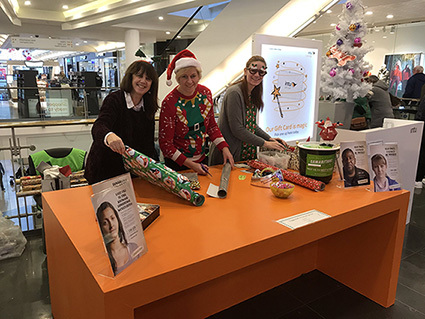 On the 16th December 2017 a group of volunteers offered their sevices Christmas Wrapping at the intu shopping centre in Uxbridge. With the prime position outside Debenhams, it wasn’t long before the team were at full capacity expertly wrapping gifts of all shapes and sizes. The team were pretty exhausted wrapping from 9am to 8pm but with Barclays matching every donation, it was certainly worth all the effort. The total amount raised on the day was £650 and when doubled this makes a staggering £1,300! A massive thank you to every volunteer who helped and supported, especially Karen who stayed all day and organised the event, and the generosity of the public. All money raised goes directly to the branch. Donate £50 to sponsor the running of this branch of Samaritans for one day.